1. Screw conveyer is a new type of transporting equipment, which use rotary screw vane to push material continuously in closed housing with round section. 2.Main characteristics: compact structure, small cross section, light weight, good seal performance, high transport efficiency, flexible technological arrangement, and easy to be installed, dismantled and moved, safe operation. It is applicable to transport various kinds of loose material such as power, granular and small piece material, for example: clay powder, pulverized coal, cement, sand, grain, small piece of coal, cobble and cast iron filings, etc. it is not applicable to transport material with high viscosity, easy to be curdled. 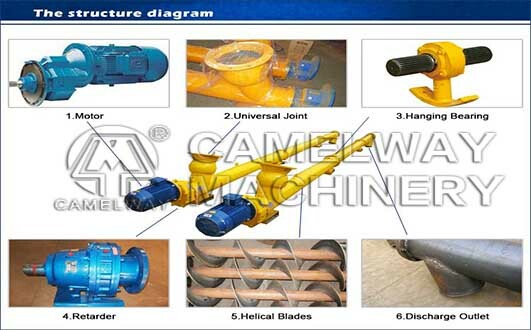 3.Screw conveyer has horizontal, inclined form, and it can be used with other transport device, to accomplish combined transport, separate transport, mixing, blending dehydration, compounding, discharging and stacking, etc. the product is suitable to loose cement transport from cement warehouse to mixer or form cement warehouse to compounding machine at concrete batching plant.